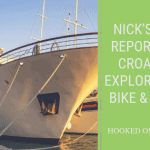 Welcome to Hooked on Cycling Holidays and our cycling holidays in Croatia. This particular cycling holiday is available as a self-guided bike tour in Croatia. We take you to the mid-range and high mountain regions of the Croatian hinterland. Only 12 miles, 20 km away from the more developed and well-known tourist areas of the coast of Croatia, you enter a rouged region of deep forests and stone deserts, where the Bora wind has had a strong impact and where the snow is metres deep in winter. En route, you cycle through three national parks, where bear, wolf and lynx can still be encountered in the wild. The variety and beauty of nature will constantly surprise you, and the fabulous views across the Croatian islands will stay with you for a long time. The high point of the tour are the Plitvicer Lakes and their spectacular waterfalls, which are known far beyond Croatia’s borders. Arrival to Fužine, by train to Rijeka or by plane to the airport of Rijeka/Zagreb/Trieste or Ljubljana airport. On request, we gladly organise for an additional charge a transfer from the airports or the Rijeka train station to your hotel. You have the rest of the day for a short introductory bike tour along the three lakes, located in the immediate vicinity of the village, or in the surroundings. If you still have time, there are several possibilities to extend the bike tour. A detour to the 300m deep Vrelo Cave, which is only a few kilometres away and one of Fužine’s main attraction. You spend the first night in a hotel in or near Fužine. Please Note: Bike delivery is dependant on bike delivery schedules. Please advise as early as possible if you wish to have bikes for the above mentioned ride. Day 2 – Risnjak National Park 34 miles 54 km 1000 metres level of elevation. After a fortifying breakfast at your hotel, you start on your first cycle tour. The destination is Risnjak National Park. Ris is the Croatian word for lynx, so that Risnjak means something like “Place of the Lynx”. You reach the entrance to the park after about 25 km. From here, you have the possibility to explore the park either on foot or by bike. There is a special trail for nature enthusiasts, where you can learn everything about the local fauna and flora. The park itself is home to many protected plant and animal species. Late in the afternoon, you return to your hotel for another night. Day 3 – Fužine – Otočac 55 miles 88 km, 1170 meters level of elevation. Well fortified by a hearty breakfast, you are on your way, which takes you first along large fields and soon into a dense forest. Quite soon, right in the middle of the deepest woods, you come across a small, cozy restaurant named Vagabundo. The friendly owners are experts at creating delicious little snacks from what fields and woods supply. Even though it is still a bit early for lunch, you should not miss out on sampling a few tasty bits along with a cup of coffee. After a few more kilometres through a dense mixed forest such as it is rarely found in Europe anymore, you reach the hills sloping towards the Adriatic, which have partially been swept bare by the Bora. Here, you have breathtaking vistas across the islands of Kvarn Bay. Deep below, you recognize Krk and the moonscapes of Rab and Pag and on clear days, one see as far as Dugi Otok. The destination of this leg of the tour is the small village of Otočac at the Gacka River, which is well known for its abundance of trout. The night is spent in a hotel in Otočac. Starting from Otočac, you continue your journey to the Plitvice Lakes National Park. Passing through small villages, you ride through hilly terrain as far as the forest belt of the Plitvice Lakes. On today’s cycle tour, you even have the opportunity to go for a refreshing dip in a lake. After arrival around noon, you move into your hotel located directly in the National Park. Afterwards, you still have enough time to explore part of the national park on foot. Enjoy the fascinating variety and lush greenery of the plants and admire the waterfalls cascading from one basin into the next one. Many different kinds of fish cavort at the bottom of the clear lakes and colourful dragonflies and butterflies fill the air. In the evening, you return to your hotel and end the day with a cozy dinner. The Plitvice Lakes are Croatia’s largest national park and the oldest in southeast Europe, belonging since 1979 to the UNESCO World Heritage. In the morning, you have again time to explore another part of this fascinating natural monument. On especially constructed boardwalks, you advance, sometime right through the reed, further and further into otherwise untouched nature. After a fortifying lunch, you get back onto your bikes in the early afternoon. Today’s bike tour takes you along the Bosnian border, through dense forests and small villages, to Slunj. Its neighbourhood of Rastorke is known for being a mini version of the Plitvice Lakes. Here, the Slunjcica River branches out into many small creeks and flows through numerous cascades and smaller waterfalls into the Korona. Another distinctive features of this region are the numerous old watermills along the river. You spend the night in a hotel located right in the middle of this romantic landscape. Day 6 – Slunj – Karlovac 43 miles 68 km, 640 meters level of elevation. After breakfast, you leave Slunj which, incidentally, just as the Plitvice Lakes, could be admired in the film version of Winnetou. An Indian village and the saloon were located in Slunj, and Mile Strk, a local villager, who is still a legend today, played the medicine man. Today’s tour takes you to Karlovac, which is one of the youngest cities in Croatia. Founded in 1579 at the confluence of four rivers, the fortress is considered an outstanding example of Renaissance architecture. The Baroque historical centre was heavily damaged in the war but has largely been restored in the last few years and offers now some attractive corners that are worth visiting. Give yourself some time in the evening to stroll around and taste a glass of the local Karlovacko beer. Today, you can choose your activities from a rich program. Because of its location at four rivers, the region around Karlovac offers various cycling tours of various lengths and grades of difficulty that we will show you. As an alternative, you have the possibility to participate through your local hotel in rafting tours, fishing courses, horseback excursions or hikes. Everybody can find something here to spend a pleasant and interesting day. After breakfast, check-out and individual journey home or you may prolong your hotel stay. On request, we can organize a free return transfer to your first hotel in Fužine. Fly to Rijeka, Zagreb airport where transfers are available on request.